Thank you Page Customization is available starting on our Startup Plan. When a customer writes a review for your business, they are immediately sent to your thank you page. This guide walks you through how to customize this page. 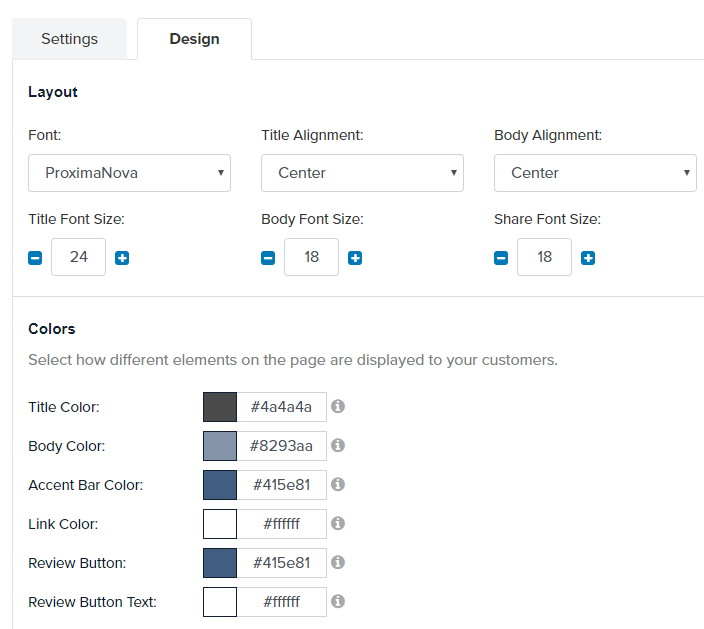 The text and colors have been optimized by our team, however you have complete control to customize these options. Main Title "Thanks for the review"
When these items are saved, the updates are applied in real-time. 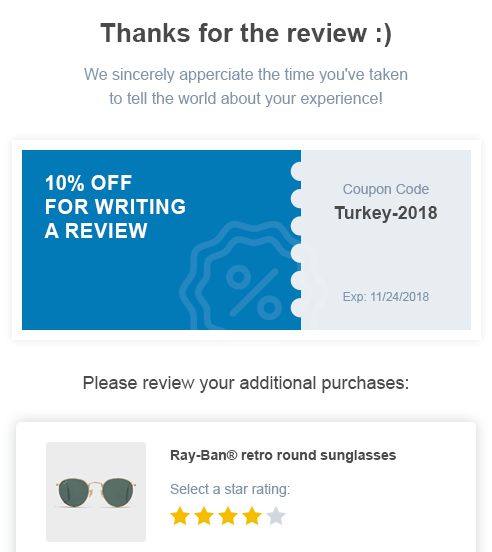 This feature allows you to prompt users to review all other products remaining in their order, that has not received a review yet. This is a great way to increase your response rates, without waiting for emails to be sent to the customer. Simply enable the checkbox "Display additional purchases", and you're all set. Note: As of October 2018, Google+ is shutting down as announced by Google, which is why we removed this checkbox from the screen. If you prefer to disable social sharing, simply uncheck each box, than click Save Settings. The last content area allows you to control the 2 links that appear at the bottom of the page. By default, we display your website and profile page url. Once you've made the text changes, click Save Settings. The design tab is meant to give you full control over all Font, Text, Sizes and Colors. There are many options here, so this guide will detail below each one. Once you're happy with the options, click "Save Settings" to see how everything looks on the right preview. If you've made a mistake, you can always revert to the default options by clicking the "Reset to Default" button.